The first person you met at GW probably wasn’t your Colonial Inauguration leader, your resident adviser or even your roommate: It was probably your tour guide. I still remember the girl who showed my family around campus, though she has likely left GW by now. She was a very enthusiastic sophomore who was applying to transfer into the School of Media and Public Affairs. As a senior in high school, I felt connected to her because I, too, was excited about SMPA. I don’t remember her name, but she inspired me to become a tour guide. It took me a while to gather the courage, but I applied to be a Student Admissions Representative — a STAR — in my sophomore year, and I was accepted. But eventually, giving an hour-long tour once a week, giving a special group tour each month, attending a monthly meeting and picking up extra shifts for spring visit days got to be too much. I was spending time promoting GW, but I wasn’t being paid to do it. After a while, I decided there were better ways to spend my time, so I left. I’m sure there have been others like me who felt that the work they put in as STARs didn’t match what they got out of it. GW does pay its summer tour guides, but should strongly consider compensating all students who lead tours on campus year-round. Of course, students at any university participate in plenty of on-campus activities for which they don’t get paid. Whether they join club sports, lead an advocacy group or participate in Greek life, most students don’t receive any form of compensation for their activities. The difference, though, is that students who give tours are walking advertisements for GW. They talk about the best aspects of the University, show off the best parts of campus and tell their most interesting stories about their time in D.C. They may even convince a few students to commit to GW, which leads to thousands of added tuition dollars — all without getting much in return. She also noted that sometimes, tour guides might meet the parent of a prospective student who can connect them to a job or internship opportunity. While that may be true, none of those “benefits” are a guarantee. At the very least, STARs should be given extra Colonial Cash, early class registration or a small stipend — something more concrete than a slightly elevated chance at a job opportunity. Stroud Felton also said that paid programs “can raise quality concerns,” drawing students who are interested in a job rather than a volunteer opportunity. It’s understandable that by not compensating tour guides, the admissions office hopes to attract students who are in it for the love of giving tours, not for the money. GW’s tour guides “get involved and stay involved because of their passion, motivation and love for their school,” Stroud Felton said. 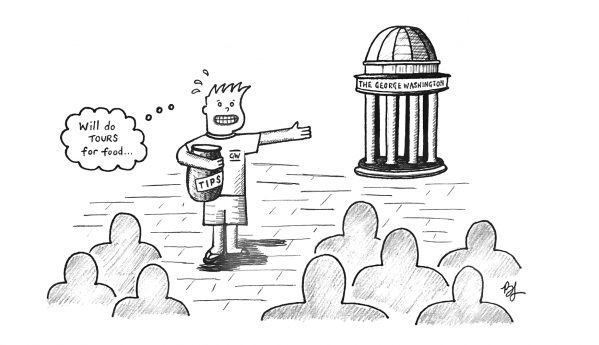 But even if the University did compensate its tour guides, the program would probably still draw a pool of applicants who are truly passionate about GW and committed to giving tours. It just might take a little more work to sort through what would likely be a larger number of applications. It isn’t completely out of the ordinary for universities to pay their tour guides. In fact, New York University — one of GW’s peer schools — pays its student ambassadors $9 per hour, an hourly wage that goes up according to seniority. Granted, NYU ambassadors are required to work five to eight hours per week — much more time than STARs are required to commit — but it’s still encouraging to see another peer school reward its student tour guides. Admissions are clearly important to GW. Last fall, the University switched up its admissions options in order to attract more students. And this spring, GW announced it would fund some students’ visits to campus and also revamped its admitted students days. GW has proven that it cares about applications and admissions. Now, the University should prove that it cares about the students who give up their time to advertise it. 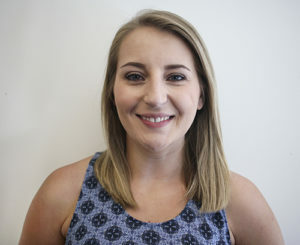 Sarah Blugis, a senior majoring in political communication, is The Hatchet’s opinions editor. Want to respond to this piece? Submit a letter to the editor.